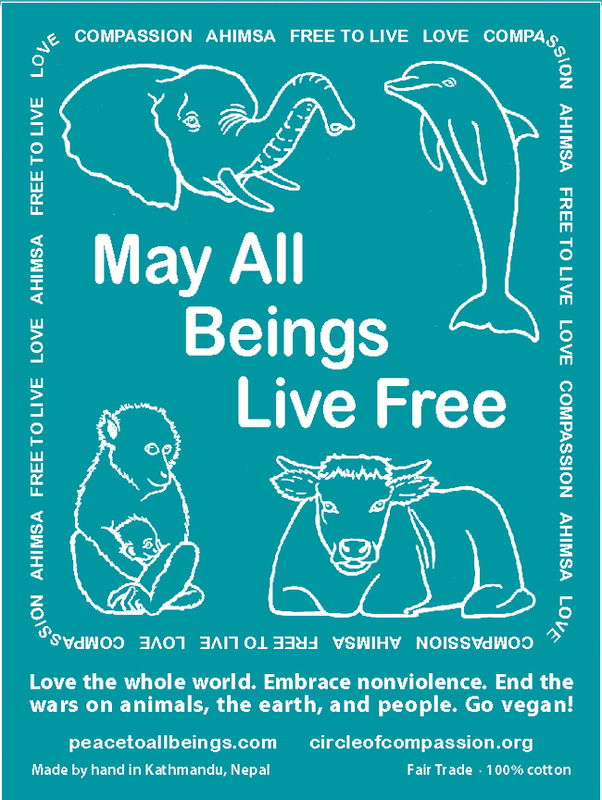 When you purchase a prayer flag, you are joining in a radical, new initiative. Prayer flags for people have been around for centuries. It is time that animals had prayer flags flying around the world for them too. There are many peace prayer flags for people with the noble vision of ending wars. However many do not realize that a war has been raging against non-human animals for centuries. Animals abused in entertainment, agriculture, experiments, etc., long for peace and freedom just as we do. Wild animals may have a certain amount of freedom but are losing habitat and suffer greatly at the hands of hunters, polluters, and other human caused violence. All of them need our help. Please enjoy the spirit of your flag at your home, school, or place of work. 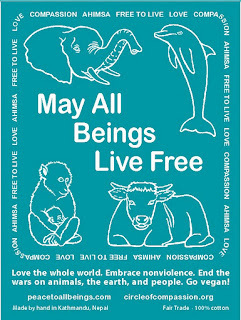 May it inspire you with a vision of peace on earth and freedom for all beings. Each flag is 100% cotton and certified Fair Trade. 1. Go to a place where animals are being abused, such as a zoo, aquarium, slaughterhouse, laboratory, feedlot, chicken farm, etc. Alternatively, you may wish to go to an animal sanctuary or other place at which animals are cared for lovingly. 2. Next, have someone photograph you with your flag in front of the place, preferably near a visible sign identifying the location. Or you can tie your flag to a fence or pole near the sign and take a photo of that. For example, it could be a photo of your flag next to the sign for your city zoo. 3. Finally, title your photo with the location and at least your first name and send it to judycarman@ymail.com. Please include your permission for me to post the picture online. 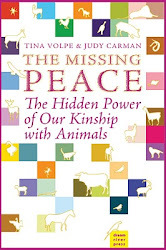 I will post it on peacetoallbeings.com. After your photo session, you may wish to leave your flag behind. It might be taken down and thrown away fairly soon if it was placed at a slaughterhouse, for example. But while it is there, the prayer on the flag and your sacred intention will be transported by the wind to places both far and near to bless the animals of earth and especially those who are suffering at that particular location. Or you may wish to take your flag with you and hang it at your home or take it to other needy animals. New Flag Idea--This is a fun way to get the prayer blowing in the wind wherever you go and educate folks along the way. May our flags carry our prayers around our precious planet and bring mercy, love, peace, and freedom finally to all beings. To order flags, contact Judy at judycarman@ymail.com or order by clicking the "Buy Now" button..
Each flag is 9 1/4" wide by 13" high and made of 100% cotton. There is a white cord sewn into the top hem so that you can hang it easily. Here are some photos so you can see how they look hanging on a fence. I took one indoors hanging on a chair so you could see it when it isn't blowing in the wind. Remember, though--we want the wind, because, just as pollen and seeds from plants need wind, the prayer energy in the flags also needs the wind to spread seeds of beautiful kindness and compassion everywhere. These flags were made by a 3rd generation Tibetan prayer flag making family. The family is originally from the small town of Yolmo which is known as a prayer flag making town.﻿ They have since relocated to Boudha, a district in Kathmandu, Nepal, where many Tibetan monasteries are located. Kazi Lama is the owner of the business. He learned to make prayer flags from his father who is now focusing his time on spiritual practice while his son runs the flag making business. The business is certified Fair Trade. France Robinson, owner of West Wind Flags in the U.S. helped me work with Kazi to produce the flags. Here is a pdf if you wish to print the flag onto paper. You are welcome to print as many as you need.